Methods used – I worked with Dahai for about an hour a few times a week. I used flexing and bending exercises, as well as lateral work to increase his muscle tone and suppleness. As he learned to listen to his rider, we moved into finer collection, increased muscle strength, and more detailed movements which required more fine-tuning in his use of his body and legs. Throughout it all, I worked on sensitizing him to leg and weight cues above rein cues. After – After about 1 month, Dahai was competent at training level dressage and basic jumping. He was soft on the bit, listened well to his rider, was sensitive to basic leg and weight cues, was no longer clumsy or uncoordinated, and had excellent muscle tone. Methods used – I spent some time with Peanut by herself in the arena, asking her with weight cues and light rein cues to slow down and relax. I then began to use her in advanced riding classes, schooling her rider to stay relaxed and encourage Peanut to do the same. Fairly quickly, Peanut was ready to move down into intermediate classes and finally into beginning trot classes. After – After about 2 months of this work, Peanut had become a fun, but reliable, lesson horse who could carry any age or experience of rider for a lesson or trail ride. Methods used – I shortened Eclipse’s traces so she was forced to work harder in order to keep up with Phoenix, and encouraged her to work when she got tired from the new exertion. I frequently asked for changes in speed to get both horses paying attention. After – After 2 months, both horses were pulling equally, listening and obeying, and we had moved on to more advanced maneuvers, like backing the wagon, pivoting, and holding without a brake on slight hills. Methods used – I started working with Shadow on ground work: lunging, grooming in the barn, grooming in the arena, tacking various places, messing around with her to de-sensitize her to non-scary things. Then we transitioned to riding work. I taught her to stand still for mounting, and we spent a lot of time building muscles, collecting, and mentally relaxing at the walk and trot. Then we worked on canter cues and cantering, building responsiveness and muscle. Finally, we started jumping, learning that there was nothing to fear from jump or rider. After – After the 2 months, Shadow had become a quiet, babysitter horse leased by a young teenaged girl for hunter/jumper showing. She would willingly and confidently carry any rider anywhere. She would stand quietly for grooming, tacking, and mounting. Methods used – I enacted strict saddling requirements while tacking Grace, which served to dissipate her biting by eliminating the pain associated with it. I began riding her by herself in the arena. As she had previously been trained for dressage, I began requiring her to do those moves again which, after a time, distracted her from misbehaving. After – Within a month, Grace was willingly doing low-level dressage, accepting the saddle again, and behaving in the arena. Methods used – Once I established that she knew her canter cues, I began to work on getting the correct leads by building muscle and circling her into her canter. After – After about 5 sessions, Bailey would usually pick up the proper lead at the canter. Methods used – I rode Seminole in various positions (front, middle, back) during trail rides, insisting that he stay at the pace of the group. Once he got that, I started asking him to wait while other horses walked away from him, teaching him to trust his rider. After – Within 2-3 sessions, Seminole was manageable at the front, in the middle, or at the end of a trail line. He had settled into a sane and pleasant trail horse. Methods used – I worked largely with Lady on increasing her awareness of her rider, listening to her rider, and de-sensitizing her to “scary” things. She learned to trust her handler and to listen both on a lead line and at freedom. She also learned to jump. 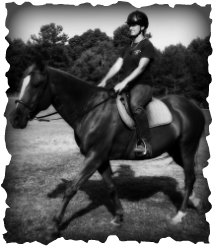 After – After 2 months, Lady was working fully in her program, carrying riders of all levels on trail rides and in arena lessons. She could be trusted as a lesson horse for any level rider in both flatwork and jumping. She respected her rider and handler without being over-sensitive and had become a barn favorite among both staff and clients.